Other Message: The Heartwood is a mix of rich chestnut and burnt umber browns with quite distinct bands of pale and darker browns. 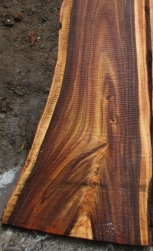 The sapwood is a light cream/yellow. The wood is hard, moderately heavy, and seasons and polishes well.